Fiber media converter is a simple but useful devices that can provide conversion between fiber optic and other types of media. The most common use of fiber media converter is transmission between fiber and copper to extend the network or introduce fiber optic cabling to a copper based network. As these devices can be installed almost everywhere in the network and it is affordable, they are also being designated for many other applications. Various types of fiber media converters are provided in the market, people easily get confused during selecting the best ones for their projects. In this post, the fiber media converter selecting guide will be offered for your references. To select the right fiber media converters for your project, many elements should be considered. You should firstly consider where you want to use fiber media converters and how to use them. Then, You should know the functions and characters of fiber media converters. The following will list some important factors that should be considered during fiber media converters selection. Data Rate: the speed of the devices that fiber media converter is to connect to should be firstly considered. The most commonly used are 10/100Mpbs, 10/100/1000Mpbs, 1000Mpbs. Fiber Type: which two different types of transmission medias should be converted between each other? For example, fiber optic to copper, single-mode fiber optic to multimode fiber optic, dual strand or single strand, etc. Wavelength: to add the fiber media converters to a fiber optic network, the wavelength that the signal should be specified to the network and the devices. 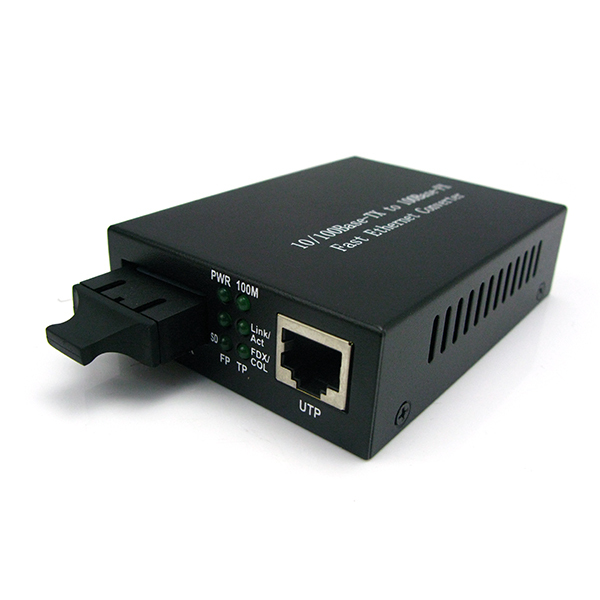 Port Type and Port Number: fiber media converter also have various port type. The most commonly used types for fiber optic on the fiber media converters are ST, SC and SFP. The number of the power should depend on the applications. Transmission Distance: the transmission distances of a pair of fiber media converter are also various and can satisfy various requirements from 2km to 15km or more. PoE Function: PoE fiber media converter can fully satisfy the need to be powered in physical locations where main power is not available or difficult to deliver. Power Requirement: the most commonly used are AC power supply, DC power supply,, internal power supply, and external power supply. The above mentioned are the basic factors that should be considered during selection. However, as mentioned the applications are also very important. To offer a more simple and direct way for fiber media selection. Here collected the different fiber media converters and divided them according to their applications. Click the fiber media type in the following table, you can find the fiber media converters belong to this catalog, with their specifications and prices in details. This entry was posted in Fiber Media Converter and tagged fiber media converter on June 9, 2016 by Alice Gui. Fiber optic media converter is a device which can connect two types of medias, like copper to fiber optic and single-mode fiber to multimode fiber. As a cost-effective device that can connect two dissimilar cable media, it has been widely used in today’s network, especially FTTH systems. Although fiber optic media converter comes into various types according to the parameters like data rate, interfaces, form factors, power options and Simple Network Management Protocol (SNMP), the purposes to use fiber media converter in networks are usually simple. They are often used in pairs to extend a network over fiber by inserting a fiber segment into a copper network, or be used individually to accomplish the conversion between two different cable types. This post will introduce the connection guide of fiber media converters. 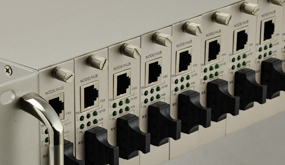 Before connecting fiber media converters, the interface of them should be firstly acknowledged. 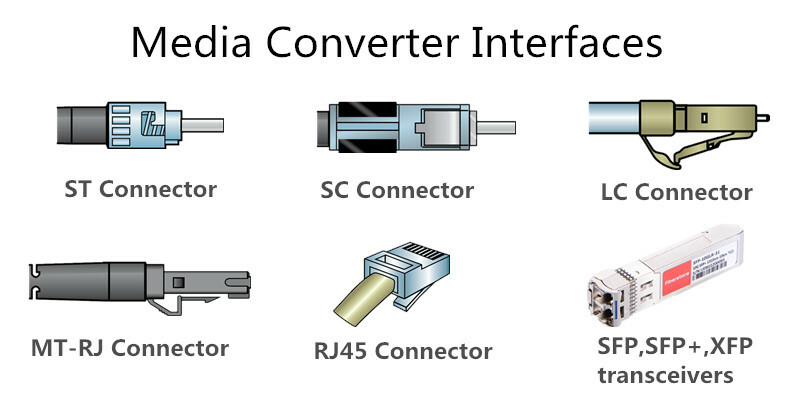 The following picture shows the most commonly used connectors that a fiber media converters may use. The ST connector is designed for fiber optic cable using a bayonet locking system. 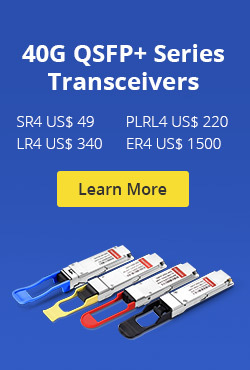 SC connector and LC connector are the most popular small-form-factor fiber connectors. The MT-RJ connector is a RJ-style connector which has a molded body. The RJ45 is the familiar to most people, which is designed for copper cable and can be found on most of our devices that need to be connected to the Ethernet. The above mentioned interfaces of the fiber optic media converter can be connected to the target devices directly by patch cords. However, for SFP, SFP+ and XFP transceivers, there are two methods for connecting the fiber optic media converter to the network. The connection methods will be introduced in the following. There is one of the most important things about fiber media converters, which is they are often used in pairs. The two fiber media converters should be connected to each other for single transmission and conversion. The above picture shows an application example of fiber optic media converter. For fiber media converters with fiber optic interface of LC/ST/SC/MT-RJ, the interfaces on the two media converters can be connected directly by a length of fiber optic patch cable that has the corresponding connector type. The RJ45 port of each media converter is connected to 10/100Base-TX HUB and computer server separately. The two fiber media converters should be supported by electricity. For fiber optic media converter that has a SFP/SFP+ or XFP transceiver interface. The connection between the two media converters is a little bit different from the others. Two optical transceivers are needed. Additional optical transceiver should be inserted to the port firstly and then the two media converter should be connected via ports of the two optical transceivers. If the port support 10G and the transmission distance between the two converters is less than 100 meters, then a length of SFP+ to SFP+ AOC can be used. The above mentioned fiber media converters connections are just the most basic methods. As there are a variety of media converters and their functions are different from each other. Connecting the fiber media converters largely depends on the practical using. Kindly visit FS.COM or contact sales@fs.com for more details. Our professional sales and technical support are willing to solve your problems about media converters. Related Article: Which Fiber Media Converter Is Perfect for Your Project? Related Article: Fiber Media Converter: What Is It and How It Works? This entry was posted in Fiber Cabling, Fiber Media Converter and tagged fiber media converter, Fiber Optic Media Converter on April 28, 2016 by Alice Gui. Fiber Media converters are flexible and cost-effective devices for utilizing and optimizing fiber links in all types of networks.They are key components of optical networking because its long-distance operation, high bandwidth capacity and reliability make fiber optics probably the most desired channel for data communications.There are lots of types of Media converters,today ,we’ll concentrate on talking something about the Ethernet Media Converters. What is a Ethernet Media Converters? An Ethernet Media Converter enables two network devices with copper ports to become connected over extended distances via fiber optic cabling.It is also useful if EMI/RFI emissions or interference are of concern as the device will convert the electrical data signals into light pulses which will travel within the fiber optic cabling. This has two additional benefits. It electrically isolates both network nodes from one another eliminating any ground loop concerns or voltage spikes from lightning. Additionally, it provides a measure of security for your network transmissions because it is virtually impossible to take advantage of the transmitted signal without detection. How does an Ethernet Media Converter work? Ethernet Media Converters normally have two types of ports; one for that copper (UTP/STP) side from the conversion, (usually an RJ45 jack), and one for fiber side, which could vary with respect to the unit (usually ST,SC or LC). Once you have selected the press converter that meets your needs, you just plug your copper network cable into the RJ45 jack and then make your link with your Fiber optic cabling. For the majority of unmanaged Ethernet Media Converters when you power up the unit you’re done with your installation.Because of the large number of different switch and converter products in the marketplace today, it is quite likely that your network uses switches from different vendors, or maybe different models of switch in the same vendor. 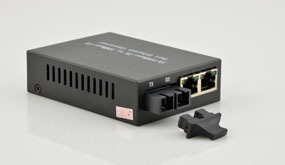 In fact, if your network has already been using one switch with a built-in fiber port and you wish to connect the fiber port to a copper-only switch, you could do this by inserting an Ethernet-to-fiber media converter between the two devices. Where are Ethernet Media Converters used? 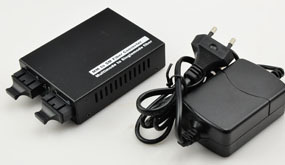 Ethernet Media Converters are utilized wherever long network runs are needed that exceed the 100 meter maximum segment period of traditional copper UTP/STP for example large Corporate or University campuses, large high rise buildings or Municipal buildings that cover a wide area or wherever ground loops or voltage spikes from lightning may be reason to be concerned. You will also find these items wherever intense EMI/RFI that could interfere with your network exists such as Industrial/Manufacturing Facilities or perhaps in environments where the introduction of stray electrical signals are strictly regulated such as hospitals, clean rooms and aircraft just to provide a few examples. 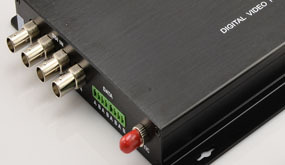 A pair of media converters may be used in point-to-point connections that connect two UTP Ethernet switches (or routers, servers, hubs, etc.) via fiber, or to connect UTP devices to workstations and file servers. Within this application example, 10/100 media converters are set up in a Redundant Power chassis for high-density fiber distribution from UTP switch equipment(A) in the network core. A UTP workgroup switch (B) is connected via fiber to the network core with a standalone 10/100 media converter. Another 10/100 converter enables fiber connectivity to some PC UTP port inside a fiber-to-desktop application (C). 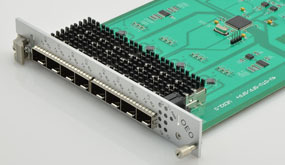 An Ethernet switch (D) is connected directly via fiber towards the media converter module at the network core. Get more information about Fiberstore, click here! This entry was posted in Fiber Media Converter and tagged Ethernet Media Converters, Fiber Media Converters on August 8, 2014 by Admin. 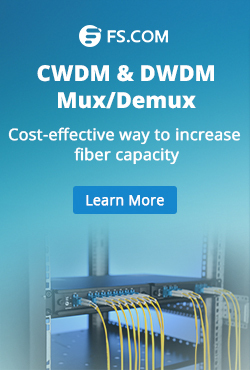 If you have a network that uses the older type of copper cables and another network that utilizes faster and more reliable fiber optic cables, it is possible to connect them together by using a special product named Fiber Media Converter. A media converter changes signals on a copper cable to signals that run on fiber, make one cable “look” like another cable without changing the nature of the network. Due to this function, network executives who need to upgrade their systems from copper to fiber but don’t have the budget, manpower or time, just turn to media converters. Fiber Optic Media Converter is a small device with two media-dependent interfaces and a power supply, simply receive data signals from one media, convert and transmit them to another media. It can be installed almost anywhere in a network. The style of connector depends on the selection of media to be converted by the unit. 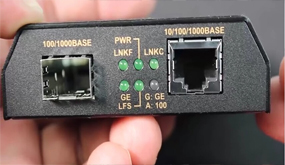 In a Fast Ethernet environment, a 100Base-TX to 100Base-FX Media Converter connects a 100Base-TX twisted-pair device to a 100Base-FX compliant single or multimode fiber port that has a fiber-optic connector. In a Gigabit Ethernet, a media converter commonly is deployed to convert multimode to single-mode fiber. Media converters are designed to be implemented in Ethernet networks and some ATM applications. Media converters are also playing a role in facilitating the optical last-mile connection to metropolitan-area networks. How does a fiber optic media converter work? Media converters work on the physical layer of the network. They receive data signals from one media and convert them to another while remaining invisible to data traffic and other net devices. They do not interfere with upper-level protocol information. This lets them support quality of service and Layer 3 switching. Media converters change the format of an Ethernet-based signal on Cat-5 into a format compatible with fiber optics. At the other end of the fiber cable run, a second media converter is used to change the data back to its original format. One important difference to note between Cat-5 and fiber is that Cat-5 cables and RJ45 jacks are bidirectional while fiber is not. Thus, every fiber run in a system must include two fiber cables, one carrying data in each direction. These are typically labeled transmit (or Tx) and receive (or Rx). Media Converters can function in either half-duplex or full duplex mode. Full duplex Ethernet over UTP runs at 20 or 200Mbps, while half-duplex Ethernet over UTP runs at either 10 or 100 Mbps. 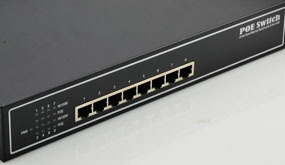 Full duplex Ethernet is especially valuable in linking two switches or connecting a switch to a file server. No adjustments are necessary when using either mode. A Fiber Optic Media Converter will automatically sense which mode is in operation. There are several types of fiber optic media converters available, such as Ethernet Media Converter, 10/100/1000 Media Converters, Gigabit Ethernet Converter, Mulitmode Singlemode Media Converter, 10 Gigabit Ethernet Converter, Media Converter Rack Chassis, etc. Fiber optic converter should be placed in a secure location that can not be disturbed by people or machinery. Every computer connected to the fiber optic cable will lose it’s internet connection if the converter is removed or broken. Converters contain special materials that only work properly in specific temperature ranges so it is important to keep them in controlled temperature rooms that never get too hot or cold. This entry was posted in Fiber Media Converter, How To and tagged 10/100/1000 media converters, Ethernet media converter, fiber media converter on July 1, 2013 by Admin. Networking solutions advance at an unbelievably quick charge with new and faster kinds of cables hitting theaters often. If you possess the community that utilizes the standard form of Ethernet wires and the other community which utilizes the greater quickly and far more reputable dietary fiber optic wires, it will be possible and better to connect all of them collectively having a special number of Fiber to Ethernet Converter. To permit several networks which are utilizing various types of cabling to talk with each other, a brand new fiber optic Ethernet Media Converter attaches an Ethernet cable at one end into an optic wire on the fresh finish. Furthermore, it could be utilized inside exact same community if multiple computers are earning utilization of distinct technologies or otherwise all of them have the capability to utilize fibers optic wires. Fiber optic cables are extremely resistant to interference through electronics, wireless systems, or mobile phones, in contrast to the much more unpredictable standard Ethernet wires which could usually lose their signal in the event that exposed to specific kinds of products. This is the primary reason this is a smart decision to transform Ethernet wires to fibers optic wires, as it supplies a quicker signal than Ethernet is capable of doing delivering or receiving. Some fiber converters will function using any sort of Ethernet cable tv whilst others have only ports of either the exact 100 megabit or the 10 Gigabit speed Ethernet wires, such as the 10 Gigabit Ethernet converters. The maximum speed at which information is ready to become transferred at around the quicker type of cable tv may slightly be lowered whenever a converter is connected among two numerous types of converter cables. Varied brands and kinds of converters like Cisco in addition to HP will have diverse velocity caps. Fiber Media Converters should be included in a secure location so they cannot be disturbed through folks or machinery. In case of the converter is removed or perhaps broken, each pc coupled to the fiber optic cable might lose its Internet connection. Special care must be given to these community options. In addition, you need to maintain converters in managed temperature rooms that by no means get to less well as to cold because of the fact they include unique materials that merely get the job done correctly in a few conditions. Fiber optic cables that continue to function after being converted coming from an Ethernet cable tv have a range that’s assessed in miles. Thus, huge companies with massive networks or net service suppliers make the most of Ethernet Media converters. And, soluble fiber optics can greatly extend serialized communication reach, and also the necessary adapters and converters are usually inexpensive, dependable, and readily available. While Fiber Media Converters are employed in the Ethernet-based system, serial data communication is not limited to distance anymore. Ethernet Media Converters can effortlessly deal with 10BaseT/100BaseT/1000BaseT rates and gigabit-ready converters are obtainable too. Take benefit of this innovative networking technology right now. This entry was posted in Fiber Media Converter and tagged 10 Gigabit Ethernet converters, Ethernet Media Converters, Fiber to Ethernet Converter on June 24, 2013 by Admin.